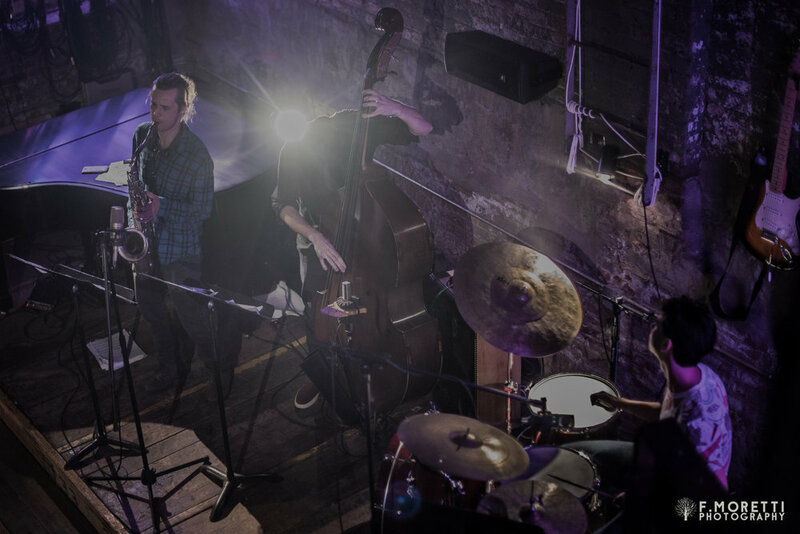 While grounded in the saxophone trio tradition of Sonny Rollins, Ornette Coleman, and Henry Threadgill, Brickwork is a band that seeks to expand and transcend the associations attached to their configuration. Saxophonist Xavier Del Castillo, drummer Vicente Hansen, and bassist Mat Muntz draw on elements from early European polyphony, Hindustani classical music, and 20th/21st century microtonality to inform their unique take on the trio format. Their debut album Imperial Cereal features original compositions, deconstructed standards, and new interpretations of works by Ornette Coleman, Ivan Wyschnegradsky, and J.S. Bach. The band released their debut album, Imperial Cereal in 2017 under the band name Mughal Muesli. Feeling a need for a more open-ended (and easier to spell) moniker, the name was changed to Brickwork in September 2018. An untitled second album has been recorded, expanding the band’s sound to include influences from progressive metal while further developing and abstracting the original inspirations of Indian, Baroque, and free music. Individually, Brickwork's members boast extensive and diverse performing experience, having played everywhere from the hallowed halls of Lincoln Center and Carnegie Hall to renowned jazz venues such as The Jazz Gallery and Cornelia St. Cafe, as well as experimental havens including The Stone and National Sawdust. Compositions by members of the trio have been featured at the DiMenna Center, The Stone, and Imani Winds Chamber Music Festival. Internationally, they have performed at the Umbria Jazz Festival, Festival International de Jazz de Montreal, Beijing Nine Gates Jazz Festival, JZ Shanghai, and Blue Note Beijing.